The 121 referees at the pro level had no obvious gifts that made them superior to the tens of thousands of college and high-school officials who would, presumably, do anything for their jobs. NFL owners soon discovered how little complex labour markets have to do with this kind of “common sense” ... The 122nd-best referee in the country was not interested in losing his own enviable job (probably working college football) for a few weeks replacing the 121st in the NFL. When the league locked its employees out, it had to descend thousands of names down the list. This is certainly a pleasing tale for capitalists in general, since it implies that those pesky proletarian referees were indeed replaceable at lower wages, it was just that the owner-capitalists went the wrong way about it. For example, if they had offered permanent contracts to the nearly-as-good referees, they could have gotten them to come in instead of the fans-in-referee-uniform that they actually got. Well, maybe. But there are some problems with that interpretation. First, if you've locked out the top 121 referees in the country, then you don't just need referee number 122. You need referees ranked 122-242. Hands up who would like switching from listening to the top 121 music singles in the country to singles ranked 122-242? I thought so. Second, Caldwell's story implies that it's just a narrow gap between a NFL referee and the man who almost could have made it and is refereeing college games instead. But is it? The crucial point is surely the gulf in talent among the players in a college and professional game; by design, the players who make it to professional are in the top few percent of all college players, who in turn are in the top few percent of all players in the country. Indeed, what turned out to the signature fiasco of the replacement referees -- the botched touchdown decision in the Seattle-Green Bay game, was due to the high talent level of the players involved, who could manage complicated sporting feats faster than the normal eye could see in real time. Sorting that out needs special talents among the referees. READING Rules. Lots of rules. N.F.L. referees have casebooks with literally thousands of play situations. We have tests every week that take five hours to finish. I study every day. When things happen on the field, I can’t stop and look it up. In other words, he invests a huge amounts of time in his job. This doesn't fit with the, say, Mitt Romney idea of investment: he's not a Job Creator, he's not putting up finance capital, and the return on his investment is not taxed like a capital gain. But it still makes him far more productive in his job than the owner fantasy of the disposable walk-on who could replace him. Saudi Press Agency -- Medina, Dhu-AlQa'dah 12, 1433, September 28, 2012, SPA -- Ministry of Hajj explained that Hajj's organization and its instructions not to allow the entry to the Kingdom for those who don't comply with terms and requirements of the entry visa to Saudi Arabia to perform the Hajj. These terms require women under age of 45 years to be accompanied with a male sponsor during the pilgrimage journey and that is stipulated in the woman's visa or her sponsor regardless of nationality. This rule is applied to all women in general who want to get an entry visa to Saudi Arabia to perform Hajj, the spokesman of Hajj Ministry Hatim bin Hassan Qadhi confirmed in a statement to the Saudi Press Agency (SPA). The statement came in response to news circulated by media quoting President of the Nigerian Hajj Mission as saying that a group of Nigerian Hajj women arrived in the Kingdom to perform the Hajj were denied entry at the airport and flew back to their home country. Mitt Romney complaining that the current US growth rate is less than that of Russia and China. Countries who Mitt Romney also thinks will be mocking us from their vantage points in outer space. Apparently Bibi Netanyahu, at the UN today, is demanding that American policy towards Iran be determined on the basis of a Tom and Jerry style bomb with a flame at the end and a red line drawn where he wants the real bombs to start falling on Tehran. Despite being asked not to do so by Phil Lynott's mother, the Romney-Ryan campaign is still using The Boys Are Back in Town on campaign stops. Here it is yesterday in Ohio. Today we have a space program befitting a President who rejects American exceptionalism, apologizes for America, and believes we should be just another nation with a flag. We have been put on a path that cedes our global position as the unequivocal leader in space. The Russians are leading in human spaceflight right now. The Chinese may someday look down at us from the Moon. Contemplate for a moment the juxtaposition of a document claiming that America needs the technological and scientific leadership of the world in terms of space with its motivating observation that the Chinese might "look down" on America from the Moon. If the issue is just the Chinese looking down at us from the Moon, wouldn't it be cheaper to just send some Americans in a ship beyond the Moon to look down at them? 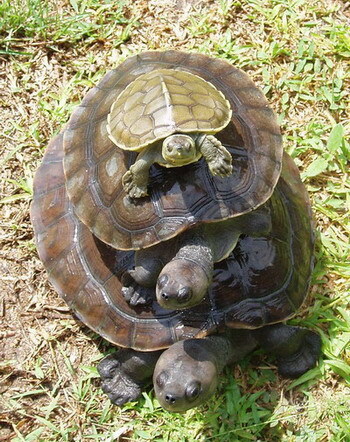 Photo of turtles all the way down: Wikipedia user Pelf. "The Obama administration doesn't want anything on a macroeconomic scale that is going to rock the global economy before November 6," a senior EU official told Reuters, adding that previous troika reports had also slipped ...A U.S. official said the United States had made clear to European officials that it wanted to avoid any "downside" economic surprises because of the fragile U.S. recovery, but denied that it had anything to do with the U.S. election. Several sources in Germany described those conversations with their U.S. counterparts and said the message had been that the Americans didn't want surprises before the election ... But one source said EU leaders' motives went beyond macroeconomic stability. They also had political reasons to avoid rocking the boat before the U.S. election. "As far as European leaders are concerned, they don't want Romney, so they're probably willing to do anything to help Obama's chances," said the source, an EU official involved in finding solutions to the debt crisis. The problem for Obama is that if Europe's leaders are seen, implicitly or otherwise, to be working to bolster his re-election chances, it could provide ammunition for the Romney campaign. European leaders have repeatedly been accused of acting too slowly and in a confused way to resolve the crisis, with a knock-on negative impact on the United States. If they are now seen to be allying with Obama, it could dent his popularity. It may be true. But it's a strangely written story. From anonymous quotes to outright political speculation at the end. Nice job of the reporters buying a few pints for whoever the talkative official was. But anyway, is it that the EU is under orders from the White House to delay this report-to-end-all-reports, or is it that they already know what's going to be in the report -- Greece needs billions more in aid -- and are looking for any excuse not to lob that political bomb into European, not American, politics? An Austrian-based group of student activists, europe-v-facebook, which has succeeded in extracting some concessions on privacy from Facebook, said the law had been waived for the tech group. "The Irish ODPC (office of data protection commissioner) says that Facebook has not fully implemented the suggestions and that further work has to be done, but there seem to be no consequences or fines for not complying with these suggestions," said the group in a statement. I think this is a very important point because you say you don’t want to interfere in the election. There are tens of millions of Americans who are watching that speech, who hear that rhetoric, who hear that charge, who may not understand the complexities of this issue. You are the leader of the Jewish people. You say this is not a partisan issue. You get billions of dollars from direct foreign investment from this country, hundreds of millions of dollars from Americans, Jews and Christians alike from this country. Conversely, when there was no American red line set before the Gulf War, Saddam Hussein invaded Kuwait, and maybe that war could have been avoided. Was it really the job of the USA to explain carefully to Saddam that No, they were not going to let him keep Kuwait if he decided to invade it? Still, the authorities have won some praise for letting the bank go under, following the rescue of Banco PanAmericano, in which the depositor fund put up a large amount of capital as part of a sale to Banco BTG Pactual SA. A number of market participants have fretted that the move sent a wrong signal and that no matter what the problems, investors would be bailed out. "I see one positive from this liquidation, as it shows that there cannot be impunity," said Paulo Petrassi, a fund manager at Leme Investimento, who manages 235 million Brazilian reais in bonds and equities. "Looking ahead, the signal is positive in terms of regulation." It's the position of the European Central Bank, at least as regards Ireland, that bondholders in busted banks can't lose even a cent. This is probably for future reference at best but the picture shows Lagan Valley DUP MP Jeffrey Donaldson meeting the Bahrain Minister of Interior on Wednesday, in Bahrain. His brother Kingsley was also apparently present. It's possible that Sheikh Rashid bin Abdullah Al-Khalifa was getting advice on dealing with sectarian strike from Ian Paisley's party. Good luck with that. Many people have read over the last couple of days about the making of the "Innocence of Muslims" and the alleged role of 100 Jewish donors in putting up the US$5 million to finance it. So today we were thinking ... hadn't the first news stories we read about this referred to 100 Jewish doctors? That's what Google thinks too, as above. 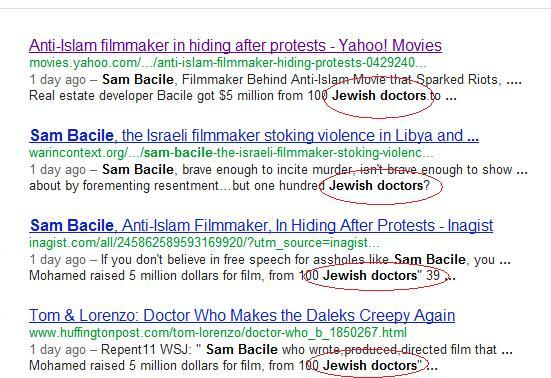 So was it just a mis-spelling of "donors" or was the initial claim of the supposed Sam Bacile that it really was Jewish doctors financing the film? If it was the latter, the cartoonish yet historically laden claim of a Jewish doctors plot to cause unrest would be a further indictment of the motives of this film. Which would be consistent with the notion of the blogger in Los Angeles who first became aware of the film that there was anti-Semitic motivation behind it. At this stage, it seems safe to say that the conservatives who have adopted the cause of whoever was behind the film are in bed with some fairly strange people, what appears to be an expatriate provocateur element among Egyptian Coptic Christians. They're not doing any favours to their brethren who actually have to live in Egypt. 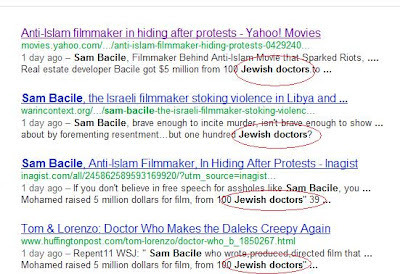 UPDATE: Interesting account from PBS Media Shift blog of how the entire early accounts of Sam Bacile were dodgy. Nor do our adversaries any longer fear us. Ask the mobs in Cairo who attacked our embassy, or the Libyan mobs who killed our diplomats at the U.S. consulate in Benghazi. Ask the Iranians, who make unhindered daily progress toward obtaining a nuclear weapon. The basic problem with this reasoning is that by its own logic, the ability of the US to intimidate "bad guys" should have peaked in 2003-2004, with 2 seemingly successful invasions under George Bush's belt. Instead it saw the, yes, weakness, of getting pulled into two prolonged insurgencies and the emergence of Al Qaeda 2.0, some later edition of which likely carried out the Benghazi attack. Note by the way the willful confusion of the Cairo mob with the Libyan militias in much of the post-Benghazi commentary from the right. Their prescription seems to be that the US should invade some Arab country, but only when it could look tough doing so. Watch Campaigns Get Combative Over Embassy Attacks on PBS. See more from PBS NewsHour. And, Ambassador [Nicholas Burns], is the Middle East doing much better today than it was four years ago? I don't think so. I don't think Egypt is doing better. I don't think that Iran is further away from having a nuclear weapon. I don't think the Israeli prime minister is more confident in American support. Apparently it's the job of an American President to make Egyptians better off than they were in the last US election cycle. Also, the claim that the transition from dictatorship to democracy has not made them better off. Freedom! 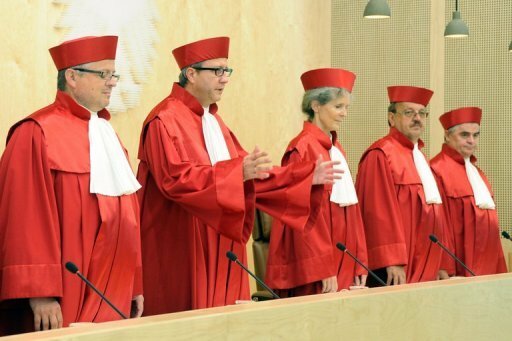 The German Constitutional Court in Karlsruhe has a big decision on Wednesday. 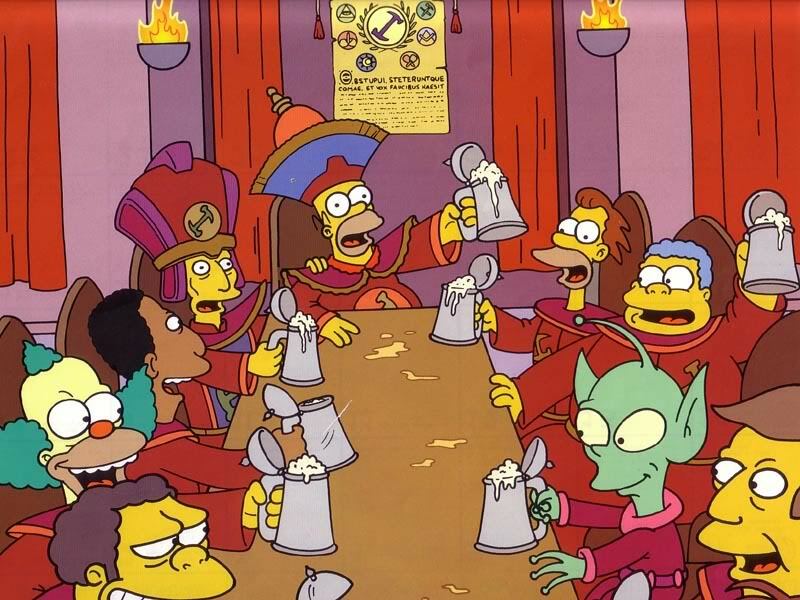 Let's hope their resemblance to the Stonecutters doesn't undercut the seriousness of their decision making. It's always tempting when analyzing the ability of Bashar al-Assad like his father before him to hang on to power in the face of widespread opposition and revulsion at his tactics. Adjectives like "wily," "intelligent," "calculating," and so on easily lend themselves to the analysis. Then you read that Bashar al-Assad's e-mail password was 1234. Then the snipers, tanks, helicopter gunships and jets that he has unleashed in his own people don't seem wily, intelligent, or calculating. It's just what he is, brutally stupid and effective only until he runs into opponents willing to presume he's that stupid. Good luck Russia and Iran with your only Arab friend. Mr Romney’s running mate Paul Ryan arrived onstage last week at the party’s national convention in Florida to the strains of The Boys Are Back In Town – a hit penned by Lynott. Philomena Lynott, a best-selling author and curator of her son’s legacy, rejected the use of her son’s music by the Republican Party. She said: “I am really upset at Philip’s music being used in a political way that he himself would not have approved of. As far as I’m concerned, Mitt Romney’s opposition to gay marriage and to civil unions for gays makes him anti-gay, which is not something that Philip would have supported.